This week we’ve had a nice shipment of Safe Explosives and Explosive delivery devices! The gifts that keep on giving! (Especially when you score a Multi-kill!) Perfect for you Airsoft Grenadiers out there! 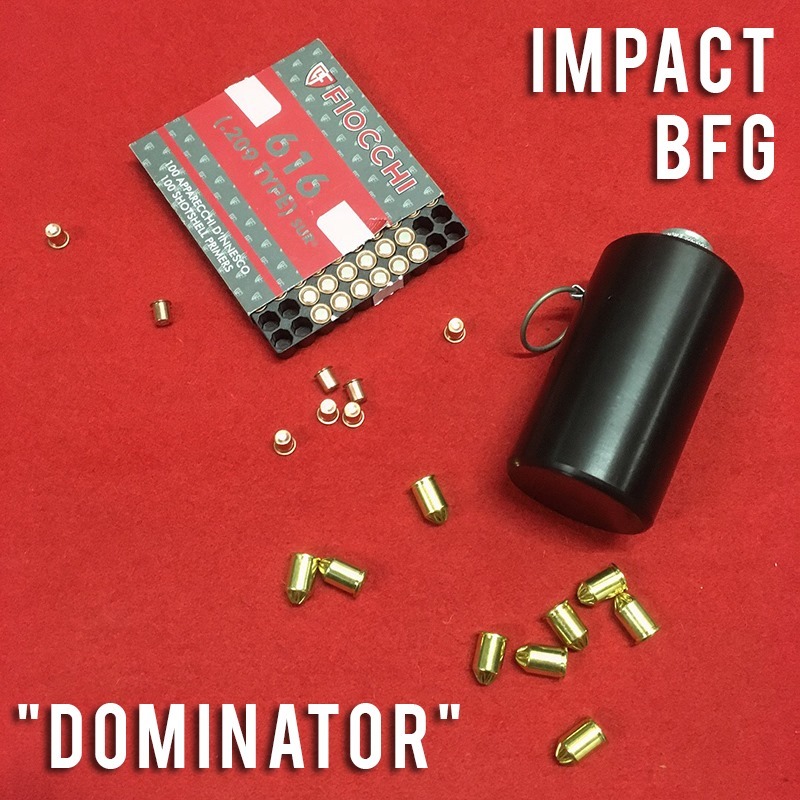 The Dynatex series of Impact grenades are well known within the Airsoft Industry. 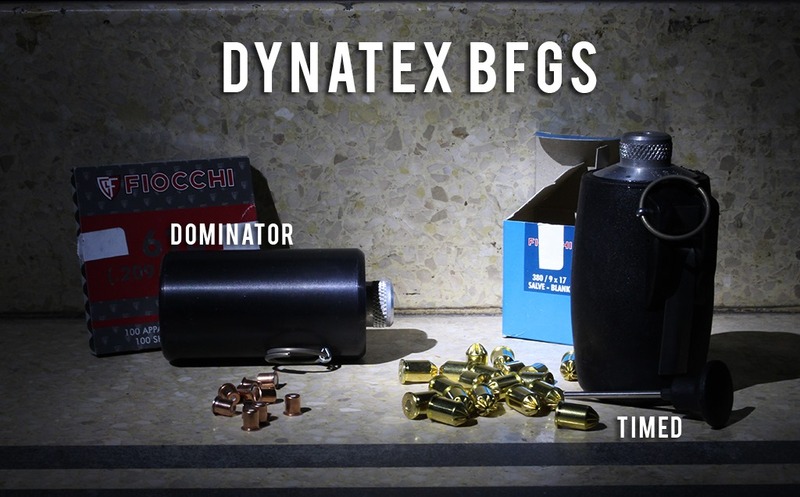 For those of you who have been around for a while, you know that when someone says BFG (Blank Firing Grenade) You think of the Dynatex! Simple and Easy to use, these Grenades can use either a Single 9mm Blank or a .209 Primer which is loaded into the screw in cap on top. (These latest grenades come with both adapters for 9mm and .209) Once Primed, all you need to do is pull the pin, send it into a room and wait for the bang! Perfect for room clearance or stalemates resolution! Once used, simply fetch it, reload the blank and re-arm the grenade! With 2 Types of Grenades on offer up first we have the "Dominator" Impact grenade. As the name says this Grenade detonates on impact with any hard or even soft surfaces so you can use it outdoors! A great tool for clearing out any well dug in defenders in CQB – Simply send this in and watch the trail of dead players walk out with their hands held high. This Grenade can still be slid into a room fairly easily however if you want to use this over longer distances (By sliding it along the floor – Throwing these things like a baseball can be extremely dangerous.) then we highly suggest its Sibling: The Time Delay BFG. 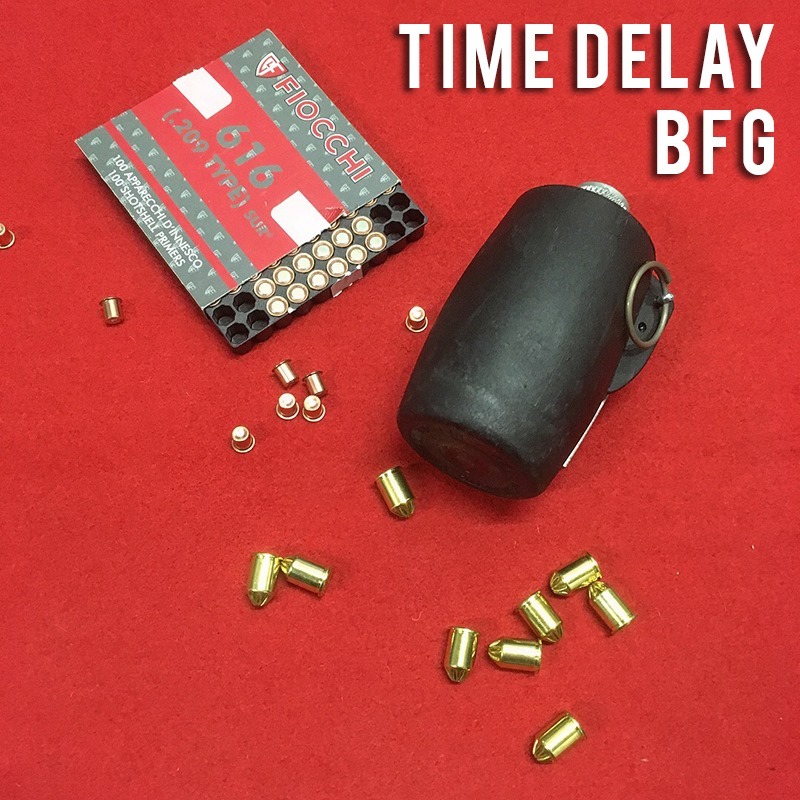 Our second offering from Dynatex is the Time Delay BFG. As the name suggests instead of detonating on impact, once the Pin is pulled and the lever is released these grenades will detonate after 3 seconds. The time delay makes these a great choice for sliding over longer distances or for setting impromptu traps for any unwanted attackers! Moving on from BFGs we’ve also decided to show some love towards Moscart Launchers! In Airsoft Grenade Launchers may seem like more of a piece of bling to hang off of your gun, but to some people they are highly useful bits of kit! For you Skirmishers they allow you to rain hell on the enemy with Moscart Shower Shells! Nothing puts the enemy off like a wall of Plastic death flying at them! For you Milsim Players, some of you may be rocking TAG rounds which is where the real fun starts! 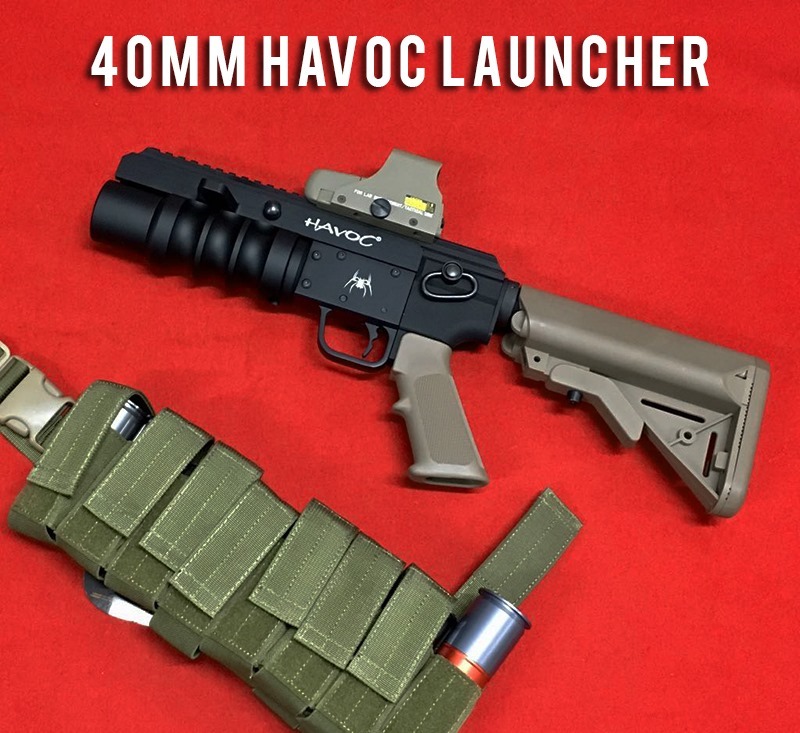 If you’re after a compact explosive delivery device then we’d like to introduce you to the Havoc Launcher! This solid full metal 40mm Moscart launcher comes as an underslung rail mounted launcher in Both a Long Barrel and Short Barrel Variant. Operating just like an M203 Launcher, the long barrel version slides open and closed to allow the insertion of a single 40mm Moscart shell. The compact variant slides forwards and then pivots to the side. Once loaded simply take aim and pull the trigger! Having recently put one together for a customer, This week we received the Short barreled variant and decided to transform it into a Standalone weapon using the Havoc Standalone Kit! As you can see we’ve been playing with some Setup ideas to turn this launcher into a futuristic Blaster! (Boba Fett Much?) We also gave it a traditional tactical makeover for those of you wanting something a little more realistic. A Launcher like this is perfect for mounting onto a single point sling and keeping on backup for when those pesky technicals roll up on your position! So if you feel like its time to bring some explosive flair into your loadout, then checkout these cool products over on our website: www.a2supplies.co.uk or visit us in store!